Mr. Holland, author of The Kennedy Assassination Tapes (Alfred A. Knopf, 2004), is completing a history of the Warren Commission for Knopf. In August 1963, Mr. Rush was a cameraman for WDSU-TV in New Orleans and filmed Lee Harvey Oswald distributing pro-Castro leaflets in front of the International Trade Mart. The truth turns out to be more complicated. Yes, Zapruder filmed the death, but he did not capture the entire shooting sequence for posterity. It is fallacious to conflate the film with everything that happened, to believe that the rifle fire commenced only after the Dallas dressmaker decided to turn on his camera. The majority of ear- and eyewitnesses in Dealey Plaza, however, heard three shots, and Dallas lawmen found three expended cartridge cases afterward in the assassin’s perch. Accordingly, the Zapruder film has always been pored over, as if it were a Rosetta stone, by students of the assassination looking for equally persuasive visual evidence that would reveal the timing of the pesky first shot. (4) The presidential limousine was much closer to Oswald’s rifle during the first shot, yet paradoxically, this bullet missed everything. Estimates as to which Zapruder frame coincided with the first shot have gyrated over the decades. The moment the first shot occurred also dictates, of course, the total amount of time Oswald had to fire all three shots, and how much time elapsed between them. Now, after more than 43 years, there may finally be a rational explanation that squares with the most important and salient facts. In what is considered by many to be the definitive account of the assassination, Gerald Posner, in his 1993 book Case Closed, posited that the errant first shot was fired at Z 160, which put the entire shooting sequence at 8.4 seconds. (8) In the 13 years since Posner’s book, several highly respected students of the assassination have weighed in with reputable analyses of the first shot’s timing. Their estimates lead to total elapsed times of around 8.8, 8.4, and 8.6 seconds. We believe that is not the case. 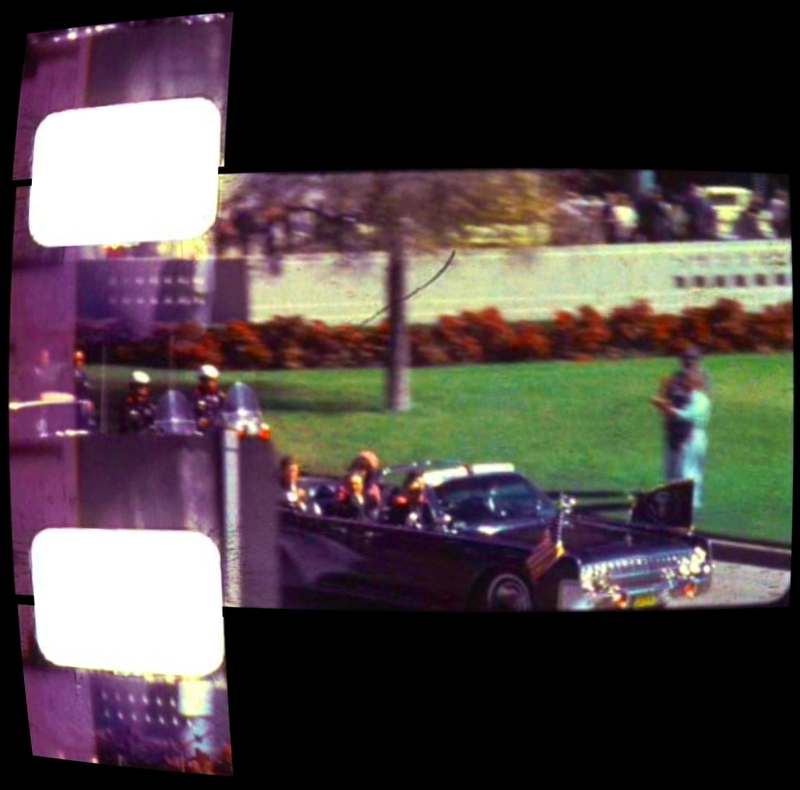 Zapruder’s 26-second movie actually has two distinct segments. 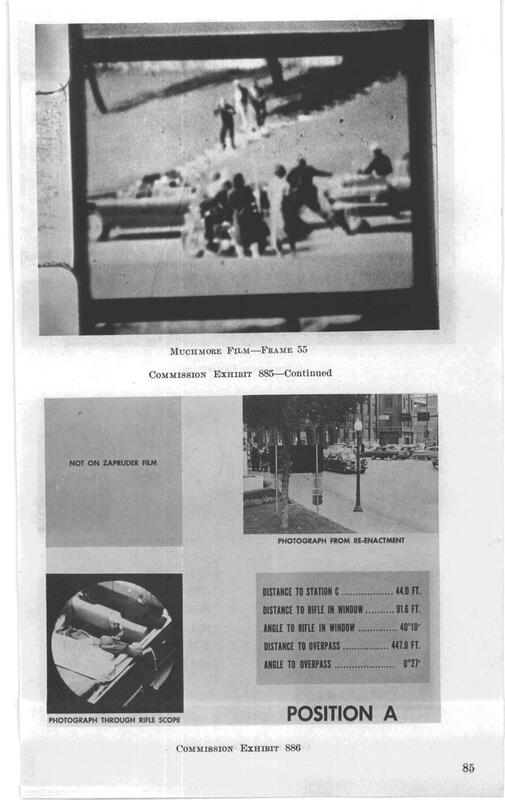 Seven seconds or 132 frames after he began filming, Zapruder abruptly stopped because all he was recording was Dallas police “motor jockeys” driving by. He did not restart his Bell & Howell “Zoomatic” until what professional photographers call the “money shot,” the president’s limousine, was clearly in view. Thus, the first Zapruder frame to show the dark blue Lincoln was Z 133—a frame exposed several seconds after the limousine had completed the sharp, slow turn onto Elm Street from Houston, and, we contend, after the first shot had already been fired. Any theory involving a first shot even as early as Z 150 faces an insurmountable problem. It directly contradicts the earwitness testimony of dozens of Dealey Plaza observers, including such notables as then-Dallas mayor Earle Cabell and then-U.S. Senator Ralph Yarborough, both of whom were experienced hunters. “There was a longer pause between the first and second shots than there was between the second and third shots,” testified Cabell. (11) In an affidavit, Yarborough recalled, “ . . . to me there seemed to be a long time between the first and second shots, a much shorter time between the second and third shots.” (12) All told, a sizeable majority of earwitnesses swore that the second and third shots were bunched closer together than the first and second shots. (13) Yet a shot at Z 150 (not to mention a later one) must ignore all this testimony, because Z 150 necessarily means that the interval between the first and second shots was appreciably shorter than the interval between the second and third. (14) A shot that occurred before Zapruder was filming, however, would neatly correspond with what so many earwitnesses heard. If one drops the illusion that the Zapruder film depicted the assassination in full, it has the added virtue of resolving two bewildering puzzles that have always defied explanation. The first one is, why didn’t Oswald shoot before Z 150, when the president was a closer target? The answer is that Oswald did. He fired the first bullet from his Mannlicher-Carcano within an instant of Kennedy’s back becoming squarely visible, which occurred well before Z 133, the moment Zapruder turned his camera back on. The second puzzle, which has been even more exasperating to resolve, is how did Oswald, who would promptly hit President Kennedy in the back at a distance of around 190 feet, and then in the head at a distance of 265 feet, manage to be so inaccurate on the first and closest of his shots? A first shot earlier than anyone has posited finally gives a plausible answer to that question, too. The traffic light still located on northwest corner of Elm and Houston is, by all appearances, fundamentally identical to the pole-and-arm combination that was there in 1963. (31) (According to Dallas city archivist John Slate, relevant maintenance records typically only go back three to five years). (32) If the arm extending over Elm is intact, it might not be too late for an expert inspection by a metallurgist. And even if the results are short of conclusive because of the passage of time, what transpired in Dealey Plaza has, at last, a truly plausible explanation. 1 David M. Lubin, Shooting Kennedy: JFK and the Culture of Images (Berkeley, CA: University of California Press, 2003), 171. 4 Lubin, Shooting Kennedy, 172. 5 The Warren Commission was not absolutely certain that the first shot missed, and also entertained the possibility that either second or third shot went awry. “The wide range of possibilities and the existence of conflicting testimony, when coupled with the impossibility of scientific verification, precludes [sic] a conclusive finding by the Commission as to which shot missed.” President’s Commission on the Assassination of President John F. Kennedy, Final Report (Washington, DC: U.S. Government Printing Office, 1964), 111, 117 (hereafter Warren Report). 6 Without being explicit, the Commission suggested the first shot occurred circa Z 161, in its “if-the-first-shot- missed” scenario. It was the panel’s next explanation, which tried to reconcile how a second shot might have been the errant one, that posited the notion of three shots in 5.6 seconds. Warren Report, 115, and 18 Warren Commission Hearings (hereafter WCH) 86. Subsequently, the widespread and still popular belief that the assassination occurred in six seconds was given credence by a 1967 book with a sibilant title. The author posited “four shots from three guns in six seconds.” Josiah Thompson, Six Seconds in Dallas: A Micro-Study of the Kennedy Assassination (New York: Bernard Geis Associates, 1967), 195. 7 U.S. House of Representatives, Report of the Select Committee on Assassinations (Washington, DC: U.S. Government Printing Office, 1979), 47, and 6 HSCA Hearings 29. The HSCA conclusions, while reliable in many respects, have to be used very carefully. The overall effort was irrevocably marred by a bogus finding of a fourth shot. 8 Gerald Posner, Case Closed: Lee Harvey Oswald and the Assassination of JFK (New York: Random House, 1993), 321. A new, lengthy book by Vincent Bugliosi, due to be published in May 2007 by W.W. Norton, might displace Posner’s as the definitive work. Bugliosi’s book, Reclaiming History: The Assassination of President John F. Kennedy, is reportedly 1,632 pages long. 9 Lubin, Shooting Kennedy, 174. 10 The basis for all guesses since the HSCA panel weighed in has been either the “jiggle” theory (Zapruder’s hands shook involuntarily in reaction to the percussive sound of the shots), or that abrupt movements by Kennedy and/or Connally as detected in the Zapruder film signaled a reaction to the first shot. 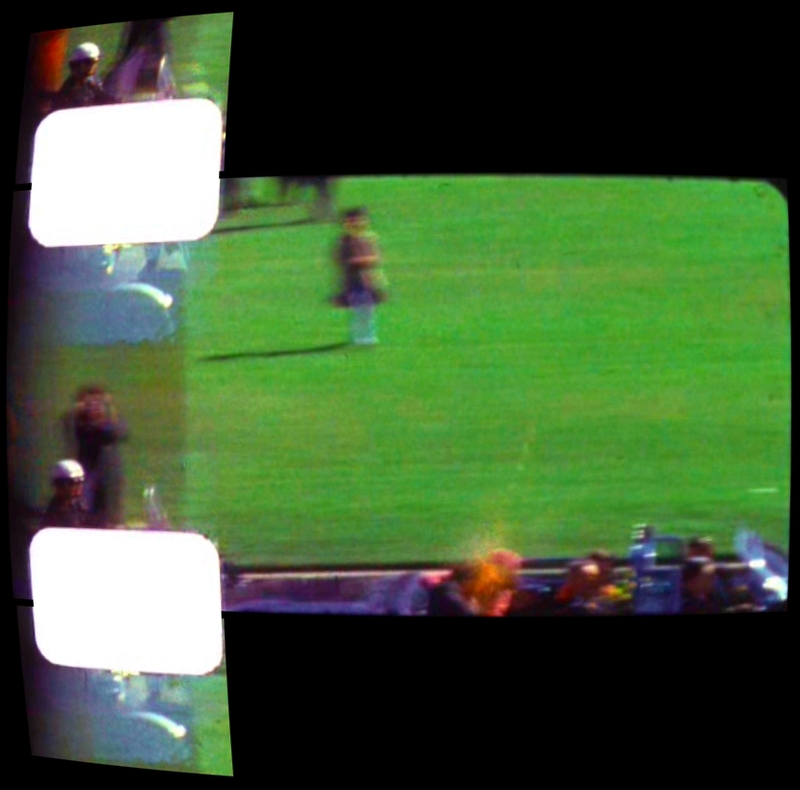 14 The Zapruder film ran at 18.3 frames per second. A first shot at Z 150 would mean approximately 3.9 seconds between shots one and two (although the reaction is evident in frame 225, the shot had to occur one or two frames earlier), and around 4.9 seconds between shots two and three. 21 Interview with Paul Landis, 12 February 2007. 23 E-mail from Dale K. Myers, 4 February 2007. Myers won an Emmy for his computer-generated reconstruction of the motorcade, first broadcast as part of the 2003 ABC News documentary, "The Kennedy Assassination, Beyond Conspiracy." In Case Closed, Posner noted that the traffic light arm (which he erroneously identified as a “tall streetlamp”) temporarily blocked Oswald’s view. But then Posner dismissed the possibility that this metal pole had played any role. “ . . . it is unlikely that the first shot hit it, since none of the witnesses recall the sound of a bullet striking metal.” Posner, Case Closed, 324. 24 http://i15.tinypic.com/48cnaqr.jpg Commission Exhibit 875, 17 WCH 880, is a still photo from the Secret Service’s December 1963 re-staging of the motorcade route as seen from the sixth floor of the School Book Depository. A rectangle has been placed around the highway marker sign; see also footnote 19. 26 http://www.history-matters.com/archive/jfk/wc/wcvols/wh18/pages/WH_Vol18_0050a.jpg Commission Exhibit 886, showing “Position A,” is a picture from the Warren Commission’s restaging of the assassination in May 1964. 29 Assume, for the sake of argument, that Zapruder’s camera had been running all along. According to our calculations, “Position A” would have corresponded to a frame at Z 100, and the first shot would have been fired at approximately Z 107/108, when the distance between the rifle and the limousine was approximately 97 feet. Thus, the entire elapsed time for all three shots is about 205 frames, or 11.2 seconds at 18.3 frames per second. 30 In its description of why the first shot may have been the errant one, the Warren Report stated, “ . . . the assassin perhaps missed in an effort to fire a hurried shot before the president passed under an oak tree, or possibly he fired as the president passed under the tree and the tree obstructed his view. The bullet might have struck a portion of the tree and been completely deflected.” Warren Report, 111. There was no mention of “Position A,” and the possibility that it was the overhanging metal arm from the traffic light that deflected the first shot. 32 Interview with John Slate, 12 February 2007. 33 Lubin remarks at the Renwick Gallery, Smithsonian American Art Museum, Washington, DC, 7 October 2004. Oswald shot as Kennedy was turning onto Elm and the bullet was deflected? So where did the bullet go? Did it also found its way down to the curb next to the James Tague? I apologize if I sound a bit snarky but your theory seems to be adding more pieces to a puzzle that no one has yet (imho) properly assembled. I can buy into an early shot if for no other reason than the position of the shell casings, in particular the casing furthest from the two by the wall and closest to the row of boxes. That outward shell casing doesn't get there unless Oswald's shoulders are almost parallel to the street when he shoots and ejects the cartridge. He would be standing, probably bent over while tracking Kennedy left to right, and he would be facing the street, which could be why Brennan and others have testified to seeing someone at the window. But an early shot also means Oswald is out of position for the last two shots. There are boxes in the way and he would have to drop to a knee and reposition and reacquire a moving target while setting up a new and probably impromptu firing position. An amateur with little to no skills at shooting at moving targets would be that klutzy but not a pro or a seasoned hunter. A missed early shot also means that Oswald didn't fully prepare for the shot and he rushed it. If a pro or an expert had preselected Houston and Elm as his kill zone, then you would have seen the preparation in the sniper's nest (and a different set up at a different window, too) and Kennedy would have been shot at Houston and Elm, regardless of the street lights. I believe Oswald did shoot early but not before Zapruder began filming, and he was out of position for the last two shots, and he didn't have the skills nor a fully functioning scope for the kill shot. JFK and Connally were hit with the second bullet. JFK was not hit by the first shot. There is no evidence that the first bullet, fired just after the limousine turned onto Elm Street, hit anyone. The second shot hit both men at around 223 to 224. Connally’s “lapel flip” can be seen in 224. Connally’s “hat flip” begins at 226. JKF’s right hand goes down between 224 and 225, but it is likely that his right elbow is going up by 224 or 225. You can read Dr. Lattimer’s article about these details in the Journal of the American Medical Association, March 24/31, 1993. You can also see some of these details in my and Dr. West’s Zapruder film analysis video of 1991, which is on file at the Gerald Ford Library. The first shot occurred just after the limousine turned onto Elm Street. It was mistaken by many people as being a motorcycle backfire. But Governor Connally recognized it as rifle shot. You can see him begin to react early in the Z film by turning his head quickly right, left, and right as early as the Z 140s. He holds that last right turn for a while, and that is the one he talked about in various testimony and interviews, regarding his reaction to hearing the first shot shortly after the limo turned onto Elm Street. Then he and JFK were hit by the second shot at about Z 223/224. This latter point about the second shot and its approximate timing has been settled by a number of investigators, scholars, and writers, whose estimated timing of the hit range is between about Z 221 and Z 225. One problem with pinpointing the time of the first shot has been the erroneous assumption that it must occur during the Zapruder film, but I believe this is a common error. Please examine the Willis picture. This is from a series of pictures on Elm Street taken by Mr. Willis opposite the TSBD. The last picture clearly shows JFK’s upper shoulders and head and you can clearly see the Stemmons Freeway sign. Zapruder is visible on the pedestal filming what will become an assassination. Studies done in the mid-1960s indicated that the moment Mr. Willis took this picture was when a first bullet is in the air toward its intended target. Connally is obviously reacting to a first shot in frames 222 and 223 when the limousine emerges from the Stemmons sign. A startled Connally is looking to his right; he is not hit at this point. Jackie is clearly looking at her husband. By frame 225, JFK is clearly reacting to the his bullet wound while Connally is showing no signs of being hit. Given the significant damage to Connally, especially to his right lung, he should be showing signs of distress. The authors stated that Connally is “reacting violently” to being hit at frame 223. This is simply NOT TRUE! The Warren Commission, being puzzled as to how to explain this, concocted the notion that Connally was suffering from a delayed reaction. Remember that Governor Connally, himself a lifelong hunter and familiar with the sounds of rifles, testified that he heard a shot before he was actually hit. That memory would be repeated in a major Life magazine investigation in 1966, in Connally's 60-Minutes interview in 1988, and again in January 1992 when Connally appeared on Larry King Live. “I heard what I thought was a rifle shot. I turned my head in the direction of the sound, which seemed to come from behind my right shoulder. . . I turned to the left, toward President and Mrs. Kennedy. In the middle of my turn, I felt a thud, as if someone had pounded me on the back with a fist, a blow so hard. . . . I blurted out the words, "MY GOD! They Are Going to Kill US ALL!” from John Connally's In History's Shadow: An American Odyssey. Further remember that private researchers asked the Connally family for permission to have the remaining bullet fragments removed from the Governor’s body. The Connally family refused this request, of course leaving in doubt, probably forever, whether the remaining fragments in Connally’s body had a greater weight than the metal missing from the magic bullet, Commission Exhibit 399. Lastly, there are two other issues which are not being addressed. In no film or photo is any member of the Secret Service reacting to any such rifle shot in any Zapruder frame prior to frames 218 to 223. If there was such a shot at frame Z-150, one would have expected to have seen at least one agent, if not more, looking either at the presidential limo or to other surrounding areas of Dealey Plaza. This is simply not the case. Neither agents Greer nor Kellerman are reacting in any manner prior to Frame 225. Note that agents are clearly reacting after Z-225. Agent Hill is seen in the Altgen photo looking at the limousine prior to his run to assist. As an aside, the newly released Jeffries film shows Agent Hill riding on left rear bumper of the presidential limousine 80-seconds prior to the assassination. Hill jumped back to the Secret Service follow-up car before the car turned onto Houston Street on its way to Elm Street. Many have tried over the years to place the first shot occurring on Houston Street or even directly below the 6th floor window. Even reading through Mr. Mason’s comprehensive list of witnesses still negates the first shot occurring in any Zapruder frame prior to approximately Z-218. The quest to suggest a first shot seems to merely be an attempt to affirm Arlen Specter’s creation of the single bullet theory. This is still a question worthy of continued discussion. I am pleased to see that someone has finally looked at, and is taking seriously, the evidence in this case and not simply expounding a theory based on what they think they see in the Zfilm. The witnesses to the assassination overwhelmingly (not a simple majority but 44 to 6) recalled that the last two shots were closer together than the first two. (I have actually compiled these at: http://www.dufourlaw.com/jfk/shot_pattern_excerpt.pdf ). As these authors note, this is a highly significant convergence that could not occur by random mistake. It is probative evidence that cannot be ignored. So this witness evidence is inconsistent with any missed first shot. But that is not all of it. The occupants of the motorcade cars put the first shot after the Vice President's car had turned the corner, and as the VP followup car was just completeing its turn. At the time these authors say the first shot occurred, these cars were well down on Houston Street. On serious factual flaw in this theory is the position that they put the President's limo in at position A. That was never the position of the actual limo. That was the position in an FBI mock-up in May of 1964, but it shows the limo in the left lane of Elm. All the cars followed the centre lane around the corner and the limo was never at that position or angle. There is no question that Oswald did all the shooting. The trick is to figure out how it occurred. While these authors have made an important realization that the witness evidence is vitally important, they have made serious errors. The way to analyse this case is to forget about the equivocal parts of the zfilm and see what the rest of the evidence indicates. Then interpret the equivocal parts of the zfilm in light of that evidence.